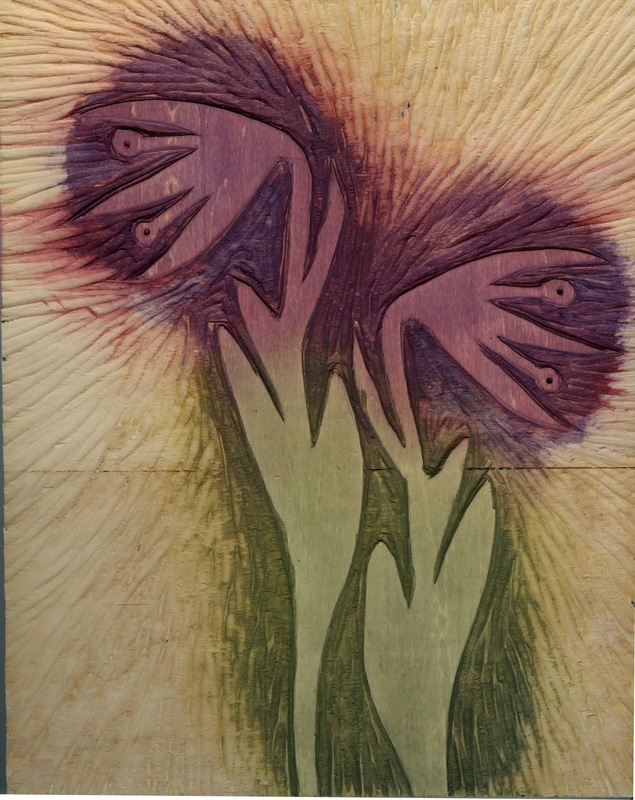 I had a lovely 2 day woodblock printing class at Mass College of Art for the last 2 Saturdays. I learned so much about the process. It was a whirlwind class but I think I have enough information to go ahead on my own with it from here. It is a fascinating process. There are so many Japanese names to remember for various things but it was fun to learn them all. 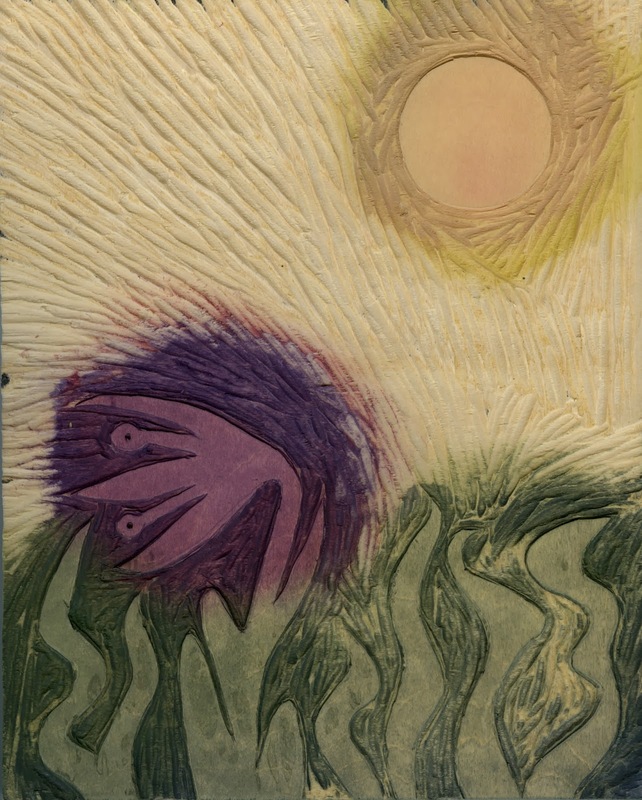 I used some of my gelatin print shapes to create this piece. It was made using 3 different plates. The first plate was not carved at all. Just inked. That created the background for the piece. It was my teachers (Lisa Houck) idea to add the sun and I am so glad she suggested it. I think it would have been quite bare at the top without it. She is going to be offering another class this winter on white line woodcuts but unfortunately I will be away on those dates. Hopefully she will offer it again at some point. 35florilegium, a photo by Roberta Warshaw on Flickr. Lately I am enamored with the ghost print. Or in this case, multiple ghost prints on top of one another. Lots of possibilities here. This weekend I am signed up for a woodcut class. This is the one I was supposed to take this summer but it was cancelled due to lack of interest. It is being offered again at Mass Art so I am looking forward to finally getting a little background in another form of printmaking. At least there is no need for a press with wood cuts. Always a good thing! I'll let you know how it goes. 30florilegium, a photo by Roberta Warshaw on Flickr. 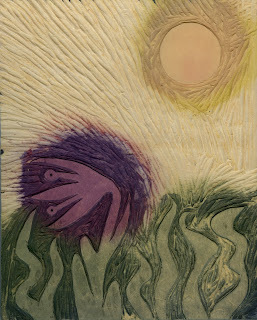 This week I decided to purchase the larger 12" x 14" Gelli plate. I wanted to make my own. I truly did. I studied all the recipes and began to get the supplies together. But the thing is, my life is pretty insane right now. Between my elderly parents needs and my grandson coming over every day after school, time is at a premium for me. Perhaps at some point things will settle down but as it is now I usually have about an hour to an hour and a half a day to work in my studio. That isn't much really and when I go in I want to get right to work. I don't want to have to make the plate first and deal with all the mess that entails. The thing about the home made plates is that they don't last for all that long. I have heard that you can add glycerin to them for a bit of longevity but the fact is that I don't even have room in my refrigerator for a plate. And they should be kept chilled. So there you have all my excuses! I haven't tried the plate yet but I am looking forward to having the extra room on it for making a framing template to accommodate a variety of sizes. 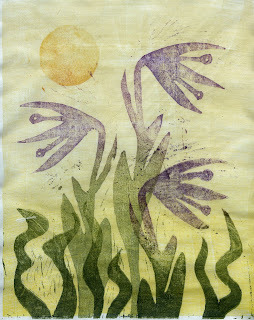 I also took Carla Sonheim's gelli printing class again and thoroughly enjoyed it! She is an amazing teacher. If you get an opportunity to take any of her classes, do it! One of the best takeaways from her class is the way she cleans her plate! A piece of paper left on the plate when you are done painting removes every speck of paint! Easier than schlepping the plate to the sink every time! I am not an artist who works really hard at selling my work. I just don’t. I am not sure why. Perhaps because I always had a job to bring in money and so I wasn’t really counting on money from art to live on. It just always seemed really hard to me. All that matting and framing. So expensive. And then when the work doesn't sell you have to find room for all that extra framing in your tiny home. Where it gathers dust. I had work in a gallery when I first started painting. Once in a while a piece would sell. It would make me feel great but as far as making a living, not so much. So now that I am retired I haven’t given much thought to selling either. I have some work on Etsy and I sell something once in a while, which is fine. I have pieces listed on my blog and I also sell from there every so often. But I don’t try very hard. And it is OK. I made my peace with it a long time ago. So when someone finds my work and shows interest in it, it is always a treat. Last night I received an e-mail from a woman with the Seattle Audubon Society. They found the above piece somewhere in cyberspace and would like to use it on some invitations they are creating for a members only show called “Rare Birds” next year. I told them it would be an honor to let them use it. The Audubon Society wants to use one of my art pieces. Wow! Now that is exciting! You never know who is going to see your work and like it do you? 28florelegium, a photo by Roberta Warshaw on Flickr. I don't know how it came to be October already but it is. I am not too happy about it as it can only lead to one thing. Winter. And I hate, no make that loathe, winter. But I can't do anything about it so I may as well just make art. I love the simplicity of this piece. Sometimes a piece just works with very little hoopla. Other times, it is a struggle. Unfortunately the mask tore after only a few uses. Sometimes they stick to the plate and tear. I think it looks like it is dancing.